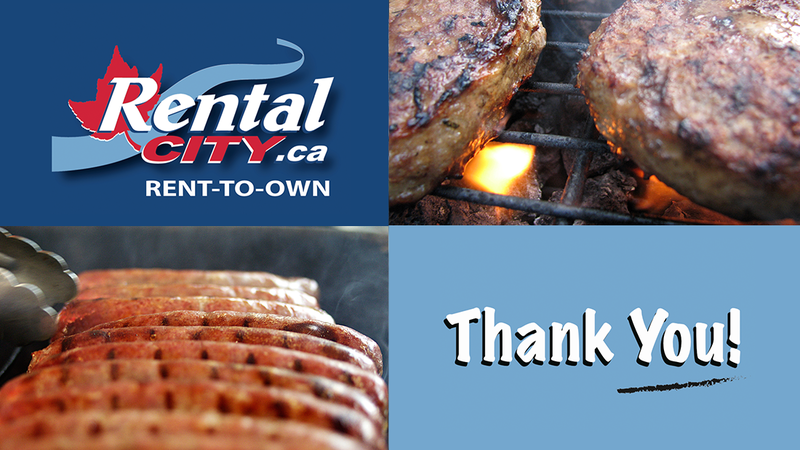 June is here, and you know what that means; It’s time for Rental City’s Annual Customer Appreciation Sale & BBQ! We’re talking ten days packed full of amazing savings, with two full days of BBQing fun, giveaways, spin-to-win, and more! Starting on June 18 and running until June 30th, come in to take advantage of our 7-14-21 pricing event. We’re lowering the cost on most in stock items! Take advantage of items priced at $7, $14 or $21 per week. Every store will have a big wheel of prizes. Every new rental gets to spin the wheel and will instantly win prizes including: free rental time, reduced rental terms, Bonus Bucks, extra draw ballots, credit towards your first payment and more! You won’t want to miss out. That’s right, we’re giving away a TRAVELQ Portable Grill from Napoleon. 12,000 BTU’s worth of grilling excellence that folds up for easy storage or taking it on the go with you! What’s better than taking the BBQ with you for the summer holiday season? We’ll be giving away one of these per store on Saturday June 20th. Stop in to find out how to enter the draw. We’re also giving away an iPad Air per store. We’ll be having our draw at the end of our sale on June 30th. Don’t miss out on these great giveaways. Come on out to any of our stores on Friday, June 19th, or Saturday, June 20th for our annual Customer Appreciation BBQ! We’re giving away free hot dogs and hamburgers while supplies last.